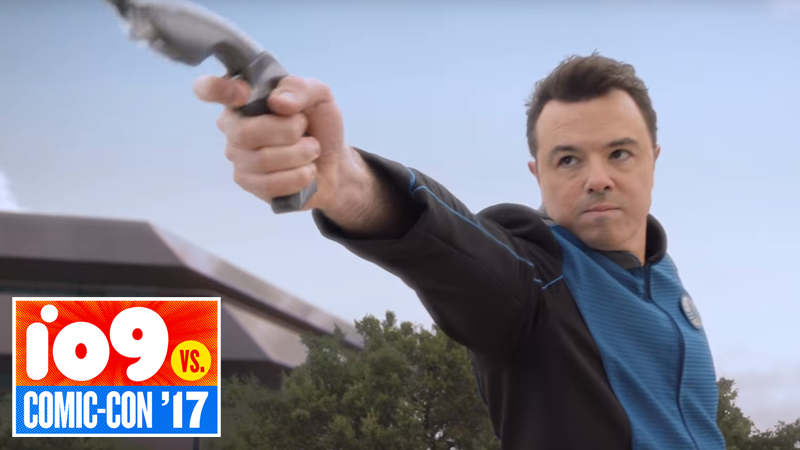 Fox’s new scifi sitcom The Orville wowed us in its first look, mainly because it managed to come off as both a loving homage to the campiest aspects of classic Star Trek while also being genuinely funny. The new Comic-Con trailer is much the same—reminding us that exploring the strange new frontiers can be a truly ridiculous endeavor. Very pointedly dropped just as Star Trek: Discovery began its panel at San Diego Comic-Con, the new trailer delivers a few more glimpses at the show’s premise than we got in the first one, but mainly decides to skip most of the jokes and focus on the big scale scifi action we can expect to see when the titular ship’s dysfunctional crew isn’t running their mouths off ever other second. Honestly, if The Orville can balance traditional Star Trek style action and its goofy ribbing of the beloved franchise, we could be in for something very fun—at the least, it’ll be nice to get two Trek-ish shows on TV this September with both this and Discovery. The Orville debuts on Fox September 10. The Comic-Con News Train Never Stops!